Yesterday I stopped by a local Wendy's for lunch. In an effort to reduce the caloric implications of this catastrophic visit, and to save a few sheckels, I opted entirely for Value Meal choices. One of these picks was a delicious 99 cent, 16 ounce Coca-Cola. I considered the 20 ounce small for $1.39, but decided that I preferred my drink smaller and cheaper - on both a nominal and cost-per-ounce basis. At 99 cents, I paid 6.19 cents per ounce. The small would have cost me 6.95 cents per ounce - 12% more. Naturally, they have to do something to dissuade me from being efficient. (Apparently, simply relying on my irrational behavior isn't enough.) Their strategy: serve my icy cola in a stump of a cup! It couldn't have been more than 2/3 the height of the small. So embarrassing! 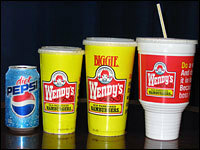 I reminded myself that when Wendy's was created, back in 1969, a 16 ounce Coke was probably a large. This reminds me of my recent visit to Target, where I compared the cost of toothpastes. You may be wondering if I really use my (ever declining) mental space on toothpaste pricing. Yes, I do. As it happens, there was a special Colgate offer boldly displayed on an endcap. (For you shopping naifs, that's the display at the end of an aisle.) Colgate offered a large tube along with a free small tube at a price that was trumpeted quite boldly, as if it was very low. The attentive dentifrice shopper always takes a moment to think, however. Over in the toothpaste aisle, in a less garish display, individual tubes of Colgate were also on sale. Cut to the cost by weight: it turns out that notwithstanding the freebie tube, you were better off buying the single tube on sale. Colgate had skimped on the "large" in the combo pack and when you studied the Target price per ounce sign, the two-fer deal was really a comparative rip-off. Who says shopping and eating have to be dull?? I'm reminded of a comment an English friend once made. He remarked that he believed "obsession with outrageously large beverages" had become a defining characteristic of the American people, right up there with love of democracy, free speech, guns, and cars. I commended him for his keen observations and went for my complimentary refill. Yes, but you got to keep in mind that the small tube is worth its weight in gold because its the only one you can take onto the airplane. My mother always taught me to look at unit pricing. This is precisely why. A similar thing happened to me at Trader Joe's. I always bought a 1 lb. bag of frozen berries. Turns out the 12 oz. carton was cheaper per ounce, after I did a price comparison. If you just rely an advertisers and marketers, they'll get you with bogus bonus packaging. More often now, it's not cheaper to buy in bulk. My wife and I have recently noticed quite a few grocery ads that contain "promotions" with a hyped large-ounce product. When we get to the store, we often find the smaller, not promoted size to be cheaper per unit, even after the discount on the larger item. Most of her students have trouble with the idea of unit prices, and I'm sure this strategy works for others who think "promotions" must be good deals. Nutrition and ingredient information is based on standard product formulations. Variations may occur due to differences in suppliers, ingredient substitutions, recipe revisions, product assembly at the restaurant level, and/or season of the year. Certain menu items may not be available at all locations. Wendy's Restaurants of Canada Inc., its franchisees and employees do not assume responsibility for a particular allergy or sensitivity to any food provided in our restaurants. Government regulations have identified 10 major food allergens: milk, eggs, wheat, soybeans, peanuts, tree nuts, fish, crustacean shellfish, sesame seeds, and sulphites. For your convenience, menu items and ingredients that contain these major allergens have been indicated. Foods cooked in common oil have also been indicated as possible allergens. Later road, we walk together!